Stockton, Calif., native Tricia Sundbeck-Bell apprenticed with the Sacramento Ballet through high school and was principal dancer with the company for eight years. Her training has included summer workshops at San Francisco Ballet and she was a scholarship student to Boston Ballet School. 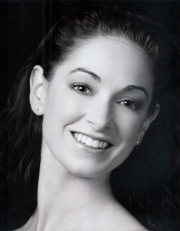 Ms. Sundbeck was promoted to soloist in 2004 at Cincinnati Ballet. Her favorite roles include Juliet in Romeo and Juliet, Marie in The Nutcracker, Aurora in Sleeping Beauty, Swanilda in Coppelia, and title roles in Giselle and Cinderella. Along with Ms. Sundbeck’s extensive Balanchine repertory, she has worked with Frederic Franklin of The Ballet Russe and Allegra Kent of New York City Ballet. As a professional dancer she has worked with choreographers Adam Houghland, Donald McKayle, Val Caniparoli, Darrell Moultrie, Sarah Slipper, Trey McIntyre, and Amy Seiwert. Ms. Sundbeck has performed in Canada, Portugal, Amsterdam and Germany, and was invited to perform at the Bolshoi Theatre in the Benois De La Danse Competition, where she received audience and critical acclaim. She teaches throughout the United States.